School suspension rates have fallen in California for students of every ethnicity in the last three years, a sign that a shift in discipline practices in many school districts is starting to have an effect, according to a study released Monday by the Center for Civil Rights Remedies at the UCLA Civil Rights Project. The study includes a spreadsheet of the number of suspensions by ethnicity in 901 California school districts. At the same time, lower rates of suspension were correlated with higher academic achievement for every racial group in the state, the study found. For African-American students, the correlation was the strongest. While some parents and educators expressed concern that suspending fewer students would lead to chaos and lower academic scores, the study found evidence of the opposite. Lower suspension rates were correlated with higher academic achievement for every racial group in the state, the study found. A push by some educators, advocates and California legislators in recent years to replace “zero-tolerance” discipline policies with conflict-diffusing approaches accelerated in 2014 when the U.S. Departments of Justice and Education jointly issued a guidance letter advising schools that the disproportionate application of discipline to certain groups of students may violate federal civil rights laws. “In short, racial discrimination in school discipline is a real problem,” the guidance letter stated. In California, the total number of suspensions, including both sending students home and sending them to an in-school area away from their classrooms, fell from 709,580 in 2011-12 to 503,101 in 2013-14, the study found, using data from the California Department of Education. Even with declining rates of suspension, students in certain ethnic groups continue to be more likely to be suspended, and disciplined more harshly than other students for the same offenses, the study found. The largest difference was in the “disruption/defiance” category where African American students received 7.2 more suspensions than white students per 100 students. The study is the first statewide analysis of the relationship between the Academic Performance Index, which is a score assigned to a school based on student test performance, and rates of suspension, Losen said. The state discontinued the Academic Performance Index after the 2012-13 academic year, so the study only examined the correlation between lower rates of suspension and higher Academic Performance Index scores for the 2011-12 and 2012-13 academic years. Driving the decline in suspensions was a steep drop in suspensions for “disruption or willful defiance,” a category used to describe non-violent misbehavior. Seventy-seven percent of the decline was the result of fewer suspensions for willful defiance, the study found. The Los Angeles Unified School District in 2013 became the first school district in the state to ban suspensions for willful defiance. 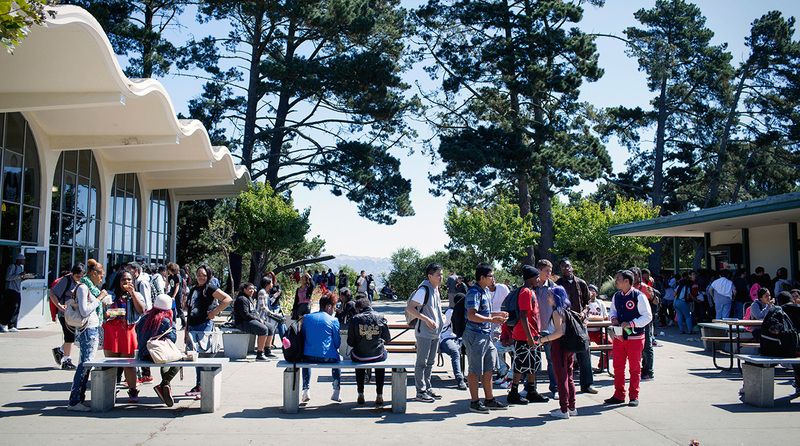 Two other large school districts subsequently banned the practice of suspending students for willful defiance, but the change did not take effect during the time period for the UCLA study — San Francisco Unified’s ban began in 2014-15 and Oakland Unified’s ban began in 2015-16. The data collection also did not include the effect of the Jan. 1, 2015 law that eliminates willful defiance as a reason to suspend students in kindergarten through 3rd grade. 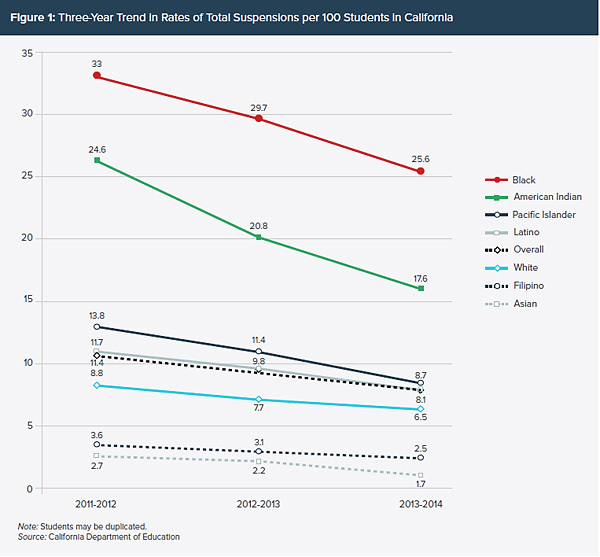 Many California school districts have reduced out-of-school suspensions substantially in just three years, the study found. Of districts with more than 10,000 students, five districts topped the list by dropping suspensions by at least 10 suspensions per 100 students between 2011-12 and 2013-14. They are: West Contra Costa Unified School District, Bakersfield City School District, Vallejo City Unified School District, Central Unified School District and Santa Rosa City High School District. The five districts with the highest rates of suspension in the state each issued 30 or more suspensions per 100 students, the study found. They are: Mojave Unified School District, Fortuna Union High School District, Oroville Union High School District, Sonora Union High School District and Oroville City Elementary School District. In addition, the study noted the districts with high rates of suspension of students by ethnicity. Schools in the Dos Palos Oro Loma Joint Unified District had the highest suspension rate for African-American students with 74 suspensions per 100 students. Thermalito Union Elementary School District had the highest suspension rate for whites, with nearly 40 suspensions per 100 students. Sonora Union High School District had the highest rate for Latino students, with nearly 62 suspensions per 100 students. Oroville Union High School District had the highest rate for American Indian students, with 56 suspension per 100 students. How was the behavior managed? Numbers Schnumbers……All comments are accurate, but how you present the info can be quite misleading. Suspensions, expulsions are down, but bad behavior is up! (Yet this doesn’t happen in the “good” teacher’s classes). Will this info be accurately presented in the data? Doubtful! I went to the school (that I worked at for two years) over 25 times and never saw a fully credentialed staff. I saw 30-day emergency subs, subs, but in the LCAP, amazingly it showed that ALL teachers at the alternative school were properly credentialed. Does this mean that the Emergency Subs were properly credentialed to teach for the 30 days? Or should it mean that a properly credentialed teacher was in place the entire time? What we really need are teachers that can manage their class without writing too many referrals, and administration integrity, ethics, and honestly when reporting and presenting data. This law is crippling education. Since it started, behavior at the middle school where I teach has gotten worse every year. Students use profanity at each other’s and staff with no ramification. They fight and get only a stern talking to. The superintendent tells our administrators to not suspend or they will be fired. The students don’t have to serve detentions or any other form of discipline because not serving it is also just willful defiance and a non-dispensable offense. So essentially kids know they can do whatever they want and a handful of them do (the ones where calling the parents does nothing because they don’t actually parent). So thanks, Governor. My wife is a physician and I’m a teacher. I thank god that she makes enough we can get our child out of public schools and into private school where they enforce rules and education can actually occur. Of course this just reinforces the punishment and degradation of the middle class in our country because they cannot afford to do the same and their children must attend unsafe and underperforming public schools. Aggregate suspension and achievement numbers do not speak to what is happening at schools. Simply banning suspensions without effective programs to replace suspensions with other behavioral interventions will result in fewer suspensions but continued unwanted behaviors. Attending school and learning are not the same though the first results in greater ADA. Some schools claim to have instituted successful Restorative Practices programs, even if we hear little about how those “successes” are measured. What I remember from my teaching days was how easily a classroom can be disrupted and learning stopped. I’d be hesitant to ever support a ban on suspensions without a mandating a paid for alternative – keeping the rights of students to learn the top priority before proportionality. This study is a great example of a bunch of numbers that don’t say anything. Of course, if you prohibit schools from suspending students, suspension rates drop. If I stop watering the grass, it will die. Not rocket science. But has the behavior changed? Do we have kinder, more respectful students in schools? No. All it means is that students who call teachers names, threaten other students, bully them, are not suspended because the higher ups have sent a message to schools: stop suspending. The lesson learned by other kids is that they too can join in on the fun. As a result, I am seeing some of the most troubling behavior by students in my 20 years as a teacher in South L.A. The idea that suspending students less is worth it because grades are improving is bewildering. The last time CA schools took a test that contributed to API scores was May of 2013. LAUSD banned willfull defiance suspensions (aka almost all suspensions) the year after that. The study measures the grades of students while they were still being suspended, at least in Los Angeles. And guess what, the grades were better! It is frustrating when the knights in shining armor produce reports, fund initiatives, and back charter schools all in the name of protecting minority students but fail to talk to the teachers who work with them every single day of the school year to see what will really work. While I do believe some schools should be monitored when there are disproportionate suspension rates between races, at 100% minority schools like mine, that issue does not apply. This minority teacher knows that a suspension is an important tool to be used judiciously to show students that in our society, abuse of others is an unacceptable behavior. You don’t have to “kick out bad kids so good kids can learn.” But you can’t allow kids to willfully defy authority on a consistent basis, which is the reality this article and study woefully omits to mention. Dropping suspension rates mean nothing. If your funding is contingent on lowering suspension rates, superintendents just start telling subordinate site admin to stop suspending. I want to see a study that shows suspension rates are down and teacher satisfaction with school discipline is up. You won’t find very many of those. As a former administrator, suspension was not something I used lightly, especially when it came to defiant students. But over time, if there was no change in behavior despite all my alternative measures, suspension was a necessary tool in getting the attention of recalcitrant students and their parents. There was no doubt at that point action needed to be taken by the parents. There is a process to follow and it needs to be adhered to. But allowing students to say “no” to reasonable and appropriate direction without immediate and severe consequences creates conditions that student will not have in future life endeavors. In other words, no workplace I know of allows you to say no to the boss in defiance of accepted company actions and instructions, which give lie to the goal of producing “college or employment-ready” students. It would be helpful if your reports included what city or region school districts are in, if they don’t have the name of the city, so readers don’t have to Google for that information ourselves.